The Birthing House is Christopher Ransom’s first novel. It’s the story of a man named Conrad Harrison and what happens to him when he leaves Los Angeles and moves into an old Victorian birthing house in the town of Black Earth, Wisconsin. Conrad has spent the last few years as a kind of house-husband to his wife Jo, who is a dynamic businesswoman. When his father dies in an accident, Conrad decides to use most of the compensation money to build a new life for he and Jo, and when he chances upon the realtor’s advertisement for the birthing house he calls up and books an appointment to view the house without even taking time to think about it. When he finds himself standing in front of the old place the next morning it is almost love at first sight. Conrad has two words for his wife: “It’s over.” He shows her some pictures of the house he has bought for them and tells her to start packing if she wants to come with him. Otherwise, she can get out. Their two dogs will be coming with him. Perhaps a fresh start in a fresh place is just what the doctor ordered, but most of the compensation money went on the house and Conrad learns he and Jo have a lot of debts he knew nothing about. Once the debts have been paid there is not much left of their nest egg and Jo tells him she will have to get another job. They have only been in the house a week when she leaves to go on an eight week training course. Home alone with their two dogs, Conrad tries to keep himself busy, but already he is beginning to notice that things are not quite right with the house. Then the former owner of the birthing house, Leon Lasky, brings around an old photograph album and tells Conrad that it belongs to the house and that they took it by mistake. After that things take a definite turn for the weird. Conrad finds a picture that is over a hundred years old. It shows a group of Victorian women standing outside the birthing house. They are a scary-looking bunch, all dressed in black with angry looks on their faces. Hidden at the back of the group he notices a woman who looks familiar. A closer look at the picture confirms it. He knows her. It’s Jo! Conrad is the main viewpoint character in The Birthing House and most of the book is written in the third person. However, one chapter is written in the first person. I can appreciate why Ransom did it this way, but to be honest it does not really add anything to the book. Neither does it take anything away though, so it does not really matter. There are ghosts in this book, so it is a ghost story of sorts and the house is haunted. It also seems to be a place that acts as a catalyst for fertility. An example of this occurs when one of Conrad’s pets has what is to all intents and purposes a virgin birth. Such things should not happen, yet they do in the birthing house. It used to a place where women came to give birth and it would seem old habits die hard. 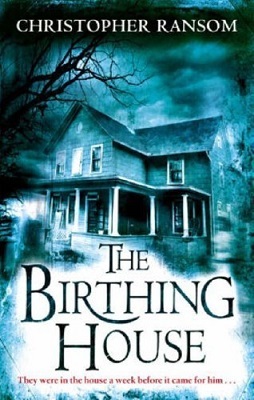 I enjoyed reading The Birthing House, the characters are interesting, and believable enough to make it rather sad for the reader when some of them die. There are a few good subplots as well. One example is Conrad’s relationship with his neighbour’s young, pretty, and very pregnant daughter. Nadia Grum helps to keep Conrad company while his wife is away and also, by telling him about her past experiences in the house, begins to fill in a few of the blanks about the property’s rather strange history. The Birthing House is 408 pages long and there are those who say that it is the scariest novel since Stephen King’s The Shining. I cannot honestly say that I consider the book to be in quite the same league as King’s masterpiece, but it is, nevertheless, a very good read and an excellent first novel.